Christmas Cactus (Schlumbergera bridgesii) are native to Brazil and have become a popular fall and winter flowering houseplant. With flowers that can last 7-8 weeks, Pink make stunning hanging baskets and 4-6" pots--excellent additions to your fall and winter sales. Our Christmas Cactus starter plants come rooted with two plants per cell and at least two pads per plant. To bloom them naturally by the holiday season (Thanksgiving to Christmas), the best time to start is early-summer. 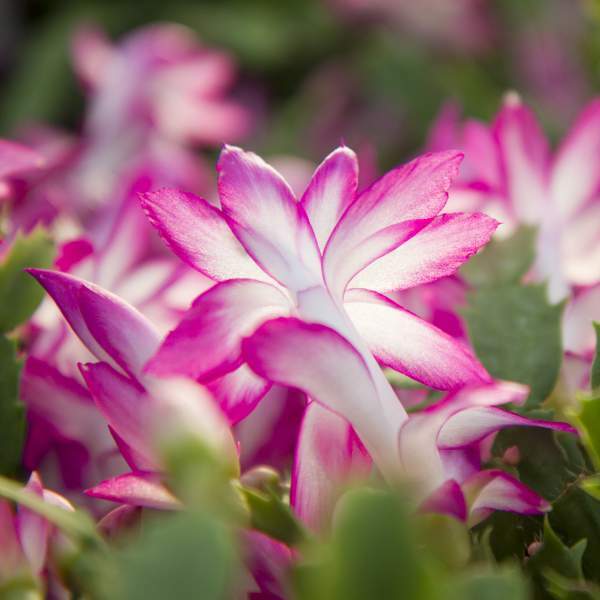 Available for delivery May thru July, these Christmas Cactus are a choice product to have on hand if you are open in the winter.For more information, take a look at this article from the Clemson Cooperative Extension (opens in a new window). Unlike other cactus, do not let Christmas Cactus dry out between waterings. This is even more important when buds set and bloom. The Christmas Cactus does not like heat, but it thrives in a humid atmosphere. It should not be placed in a spot where the temperature constantly changes, such as by air vents, heaters, or doors that open and close. If you must fertilize, then it is best to do so when the cactus is not blooming. The ideal time to fertilize is between the months of April and September. "Fertilize plants monthly from the time new growth starts in late winter or early spring, and throughout the summer using a one-half strength soluble fertilizer, such as a 20-10-20 or 20-20-20 with trace elements. Holiday cacti have a higher requirement for magnesium than many plants. Fertilize monthly during the growing season with Epsom salts (magnesium sulfate) mixed at 1 teaspoon per gallon of water, but do not apply the same week as the regular fertilizer. Stop fertilization during the late summer for greater flower bud production in the fall." Pinching back in summer if plants grow too tall will help produce basal branching and more flowers at finish. For hanging baskets, an average pot will need to be spaced at 2' centers. For smaller pots, space enough to allow proper airflow and light penetration between foliage. Plant growth regulators are not recommended for Pink.Control the size of your plants by proper pinching in the summer. Mealybugs, spider mites and aphids are the primary pests attracted to Christmas Cactus. Pink is not prone to many diseases, but don't oversaturate the soil. If the plant sits in moist soil for an extended amount of time, you could end up with root rot or botrytis. Botrytis grey rot is usually associated with wet or humid conditions. You can prevent botrytis by allowing the plant to dry out between waterings, allowing for good airflow in your greenhouse, and spacing to allow the sun to penetrate to the soil level. The most common chemicals used to treat botrytis and root rot are Medallion and Banrot. Use them as a drench according to each label's instructions. We recommend planting 4-5 starter plants per 10 inch basket. Use a well-drained soil in your baskets and plant your starter plants deep, allowing the ellepot to be completely covered by the soil. If you are planting 4" pots, 2-3 plant per pot should be sufficient. Plant them in a triangle directly in the middle of your pot. In smaller pots, 1 plant will finish nicely. Pinching is recommended in the summer months to produce basal branching.